A new report from Bridge to India reveals that India plans to install 33.4GW of solar energy by 2022, a target far higher than the 20GW initially projected by India’s National Solar Mission. The report suggests that technological improvements and economies of scale could create a downward spiral in solar costs over the next few years. By 2018, India could achieve an installed solar capacity of 14.16 GW, a time when solar power is projected to hit grid parity for the country. 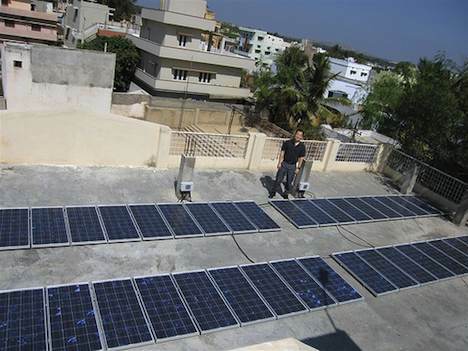 India’s plans do not incorporate government support for small or off-the-grid solar projects. But smaller projects may in fact be important in providing a larger share of power to the 40% of the Indian population currently off the grid. The country’s solar plans are reassuring given India’s sheer population size and recently acquired label as a “newly industrialized country”. The environmental ramifications of industrialization could have serious consequences if emerging economies such as India do not take proper steps to reduce their carbon footprint. Already, China has begun to lead the way in this regard, with plans for 100GW of wind capacity and 15GW of solar capacity in 2015. The country has also recognized the necessity to embark on green growth to avoid global environmental disaster. Are you optimistic about the renewable energy plans of industrializing countries such as China and India?